One of the joys of canoeing is seeing so many different people and boats at a race. Young and old; men and women; sleek hulls and… less sleek hulls. We each have our own paddling preferences, and many of us when given the chance will race C1 at one event; C2 Mixed (one man, one woman) at another, and so forth. The sport is very social, and it’s always fun to mix things up. But we are, after all, racing, and that competitive spirit bubbles up when we look at race results to evaluate our performance. We evaluate our results not only to see how we did compared to our own past performances, but how we did compared to our fellow competitors. But how does one compare their race result vs. competitors paddling different hull types, say C2 vs. C1? Or paddlers of different ages? Or paddlers of different genders? It turns out that you can apply time adjustments or “handicaps” based on these differences, and evaluate performances across all paddlers competing in different classes. In this installment of The Science of Paddling we’ll consider how one racing organization does this, and uses its approach to rank all paddlers for annual awards. Then we’ll use physics – naturally – to fill in one gap in their handicapping method when a statistical approach cannot be employed, to level the field. Their handicapping system adjusts finishing times based on paddler age, boat type (for example, C2 vs. C1, pro boat vs. 16% Recreational tandem, etc. ), and gender. Let’s consider a concrete example of the NECKRA Points Series. For each paddler between 60 and 69 years of age 1 minute per hour is subtracted from their adjusted finishing time. If a tandem canoe had one paddler aged 65 years and a finishing time of 1:30 (e.g., 1.5 hours), then 1.5 hours times 1 minute per hour = 1.5 minutes would be subtracted from their 1:30 race time to yield an adjusted time of 1:28:30. If this tandem was paddling a NYMCRA Stock canoe a further 3.5 minutes per hour (based on the original 1:30 finishing time) would be subtracted from their adjusted finishing time, or 1.5 hours times 3.5 minutes per hour = 5.25 minutes, or 5 minutes 15 seconds (aka 0:05:15). So this tandems adjusted time then becomes 1:30:00 (their unadjusted race time) – 0:01:30 (age adjustment) – 0:05:15 (hull type adjustment) = 1:23:15. Analogous time adjustments are applied to the finishing times of all racers who are NECKRA members. Similar computations are performed for all kayak finishers using kayak-specific handicaps; kayaks have their own category in the overall NECKRA Points Series. Once all adjusted finishing times for a given race have been computed these times are sorted in order. The fastest adjusted time is awarded 50 Points Series points for their performance; the second fastest adjusted time is awarded 49 points, etc. Note that the first boat to cross the finish line isn’t necessarily awarded 50 points. For example, a Men’s tandem may have had a Mixed (one man, one woman) tandem on their stern in the final sprint to the finish, and – everything else being equal – the time adjustment would award more Points to the Mixed hull. I was the “Points Person” for NECKRA from 2008 through 2012, computing the Points Series results for all of their flatwater canoe and flatwater kayak races. True to the statement on their website, the handicapping system proved to be a good leveler of gender, age and boat type. But there were a few exceptions. In 2009 I was asked to consider whether or not their C1 handicaps were fair; at the time the Mens’ C1 handicap was -3 minutes per hour, while the women’s C1 handicap was -8 minutes per hour. It turned out that all of the handicaps applied up to that point were based on experience from past races, having been set by NECKRA’s Competition Committee at their annual end-of-season meeting several years before. I did a brief statistical analysis that showed the C2 Mixed handicap of -2 minutes / hour was reasonable, as was the C2 Women’s handicap of -4 minutes / hour. 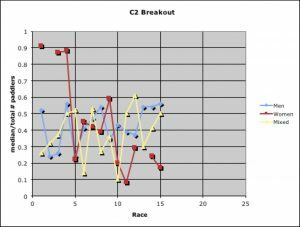 To do this I compared the median finishing positions of C2 Men’s, C2 Mixed, and C2 Women’s hulls in the first 15 races of the 2009 season based on adjusted finishing times, e.g. after applying the Mixed and Women’s handicaps to respective finishers. I used the median since race results – especially for long races, or races with many participants – tend to have a cluster of top finishers, then a long-ish “tail” of finishers thereafter. A plot of the resulting finishing positions vs. races 1 – 15 appears in Fig. 1. Figure 1: Normalized finishing position by Race for various C2 teams. Since each race in the Points Series had a different number of NECKRA participants I normalized the median finishing positions by the number of C2s in each race. As you can see in Fig. 1 there are variations race-to-race, and in some races there were no Women’s tandems. But over the course of these 15 races the average normalized median finishing position using the NECKRA C2 gender handicaps was 0.43 (Men), 0.44 (Women), and 0.4 (Mixed). This quick-and-dirty analysis showed that the NECKRA Mixed handicap of -2 minutes / hour, and the Women’s handicap of -4 minutes / hour, were both reasonable. For these racers NECKRA’s flatwater Points Series handicaps had leveled the field. Parenthetically, I never received any complaint about these handicaps in my 5 years of scoring the Points Series. My analysis did show, however, that the C1 Men’s handicap of -3 minutes / hour wasn’t as reasonable. Race results from the 2009 season showed that, using this handicap, the median finishing position in a hypothetical race comprised of a mix of ten C1 and C2 hulls was 8th. The flatwater Points Series was skewed toward C2s. I subsequently proposed a C1 Men’s handicap of -4.5 minutes / hour. This handicap has been in use since the 2010 season, and while it may merit re-visiting in light of a larger sample of recent race results it seems to be working. But what about the Women’s C1 handicap? Was it fair? There were so few Women’s C1 finishers in the 2009 season (or in the 2008 season, where I also had all the race results) that there was no way to draw a statistically meaningful conclusion either way. All I could offer NECKRA was, well, keep on doing what you’re doing in the absence of more information. But wait, what about science? Isn’t that why we’re all reading this article? Well yes, we can use physics to level the field, and determine a fair and reasonable handicap for C1 Women paddlers. And to do so we’ll leverage the C2 and C1 handicaps discussed above, and a model developed in Part 1 of our series that relates paddler power to steady-state hull speed. This means that the NECKRA women’s C2 handicap implies women exert about 82% of the power men do when paddling. The difference between the paddling powers derived using the two handicaps – 0.8126 and 0.824, respectively – is about 1.4%. That’s remarkably consistent! Consequently, the NECKRA Flatwater Points Series Women’s C1 handicap should be -8.9 minutes (8 minutes 54 seconds) per hour based on the analysis above. And what is the current handicap? -8 minutes per hour. Considering the machinations we went through to derive a handicap, the two numbers are pretty consistent, differing by approximately 10%. Where did the difference come from? NECKRA established the -8 minutes / hour time adjustment for Women’s C1 paddlers some time ago because (as I understand it) this number seemed reasonable. In light of the analysis above, it is – keeping in mind that “reasonable” is based on an analysis that relies on other NECKRA handicaps which also seem “reasonable.” We’ve merely used science to show that the NECKRA Flatwater Points Series is self-consistent, which is all you can ask for. And that physics models can extend established systems to make up for a lack of a statistically-significant sample of race results.